Every zipper, clip, D-ring, rain cover, lens cloth and piece of fabric featured on every bag in this collection is custom-dyed in any of the three of the latest trend colors (plus black) and made to match exactly. Tenba Vector bags are extraordinarily lightweight, and constructed of water-resistant fabrics for protection in wet weather conditions. Top Loads, Shoulder Bags and Daypacks all include Tenba’s exclusive WeatherWrap, the fastest deploying all-weather cover around, plus color-matched, microfiber lens cloths. The Vector collection includes three pouch sizes, the largest of which is designed to be a perfect fit for the Canon G12, Nikon P7000 or Sony NEX with a 16mm lens. For an SLR with a single lens there are two sizes of Top Load bags that can be used with the supplied shoulder strap or attached to a belt. Small-, medium- and large-sized Shoulder Bags fit cameras with extra lenses, flash and accessories. And the Daypack is a comfortable and supportive way to carry both a camera system and the other items a photographer might need during a full day of shooting, like food, an umbrella and a jacket. The new Vector camera bags are available now at suggested retail prices ranging from $12.95 to $79.95. 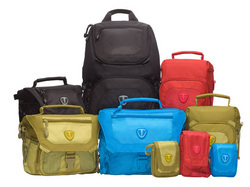 Shop Tenba Colorful Camera Bags for LE$$ / Products list Click here!